This Softail Diamond Back Seat fits with the same great Diamond Back seat styling. Fits with current Softail Diamond Back Tail Sections and Diamond Back Pillion P/N 52069-98 (sold separately). Seat width 13.8". 52629-00 Fits all '00-later Softail models (except FLSTS and FXSTD). Adds two-up capability to Diamond Back Seat. This custom-look pillion complements the seats in our Diamond Back Collection and is interchangeable with Diamond Back Tail Sections. Kit includes pillion and passenger grab strap. Pillion width 5.0". A hand-polished chrome-plated steel insert, fitted to a vinyl covered moulded base, provides long-lasting good looks. Includes mounting hardware for quick, easy installation. Can only be installed with appropriate Diamond Back Seat. Fits '82-later XL, '93-later FXDWG, '82-'94 FXR, '99 FXR models, and '84-later Softail models (except FLSTS). B. DELUXE LEATHER SOLO SADDLE WITH NOSTALGIC SKIRT 52006-47B Requires Solo Seat Bracket/ _Spring Kit P/N 52225-89. First offered in 1925, a timeless design and a comfortable seat. Solo Seat Bracket/Spring Kit (not shown) Allows you to upgrade your Softail to the nostalgic look of a leather solo saddle. Complete kit includes front and rear mounting brackets, chrome-plated springs, all necessary hardware, and a frame/battery cover for a clean installation. 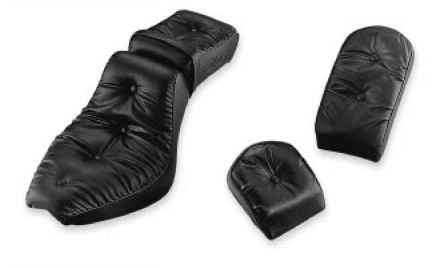 This kit is required to install Deluxe Leather Solo Saddle P/N 52006-47B or Leather Solo Saddle P/N 52004-25. 52225-89 Fits all '86-'94 Softail models. Soft, plush pillow-look seat adds a measure of comfort and style. Includes embossed "Softail" logos and passenger grab strap. *NOTE: Two-up seats and seats with passenger pillions require the use of a grab strap. 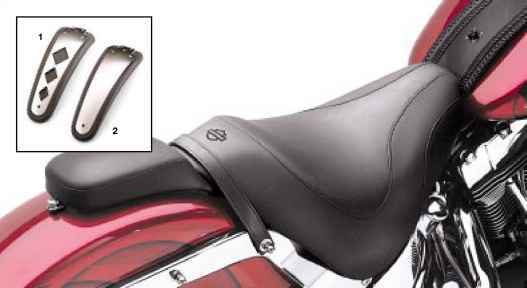 See your Harley-Davidson dealer for the correct grab strap part number if not included in the seat kit. How to install diamond back seat? 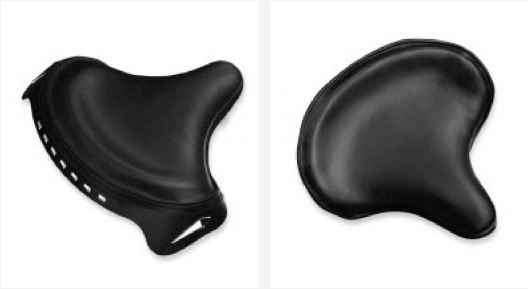 How interchangable are softtail seats flsts?